“Citrus Gypsies” are Back in G.J.! They’re BACK! 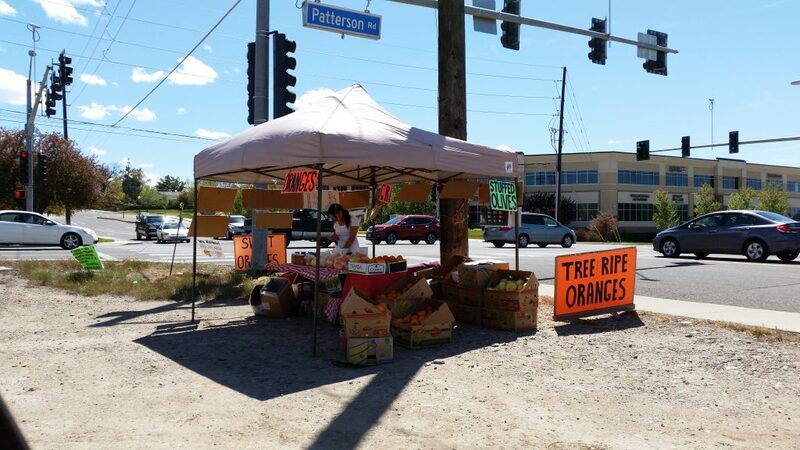 They’re the Citrus Gypsies, and they have the best citrus fruit around! (When I asked them if they had a name, Ana at the First and Patterson booth told me they don’t really have a name for their business, but that’s what they call themselves informally). These wonderful itinerant young fruit people come from a ranch in Montana and travel the southwest buying great citrus fruit at the height of the harvest and driving it to other places in the west that don’t have great fruit (at least right now). They have by far the best citrus you can get. It’s fresh-picked and doesn’t have any waxy coatings, stickers or other junk on it. They picked this last batch of navel oranges themselves from an orchard in California’s central valley, near Fresno, so they put a great deal of effort into it. Before coming back here, they took a haul to Salt Lake City and got sold out very quickly after someone posted about them on social media. Because this batch is the last picking of the season, these latest oranges have been left on the tree the longest and are super-sweet. Ana told me they’ll be here for five days, and asked me to put info about their stand out on social media. So here ya go! Stop by and get yours! They also have lemons, grapefruits, pomelos, olives and I think some tangerines and honey, but personally, I just can’t get past the fantastic oranges. Seamus on Mail order abortion pills now available in the U.S. Affordable freedom of speech, anywhere, any time! ThoughtOnBoard™! The only dry-erase board that sticks to glass. Endless uses in car, home, office and businesses. 9" x 9" size just $23, including shipping. Made in Grand Junction, CO. Visa, MC, Discover, PayPal. Fast shipping. Please keep comments civil and informative. Refrain from name-calling, taunting, use of profanity, posting any personal identifying information about others and use of personal insults. Violating the Comment Policy can result in termination of comment privileges. Copyright © 2019 AnneLandmanBlog.com. All Rights Reserved. The Magazine Basic Theme by bavotasan.com.